In order to offer a continuous character education, One Earth Primary School is committed to developing the potential of all its students, both academically and non-academically. The primary curriculum is based upon the Kurikulum Tingkat Satuan Pendidikan (KTSP 2013). To support this, One Earth Primary School also offers Cambridge curriculum in order to facilitate our pupils to improve their English language abilities. In its teaching process, these two curriculums are both applied simultaneously. The English language learning process is carried out in an interactive manner; therefore, pupils will be able to use and speak the language effectively. This is a useful tool for students to compete in today’s international world. Over time (at least once every one month), we invite volunteers with English as their mother language from all over the globe to interact with the students and help sharpen their skills to effectively speak the language. Each pupil’s inner potential will also be sharpened by joining supporting programs that the school offers. Things like yoga and meditation will heighten intuition and assist mental, physical, emotional and intellectual development. These activities are carried out every day in order to help our students channel their best gift, which is humanity. 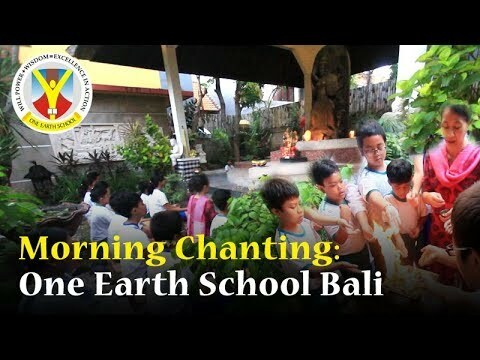 Besides this, One Earth Primary School students can also join several extracurricular activities such as scouts (mandatory), drama/ theatre and dance classes in order to channel their individual talents. For the purpose of propagating a good character rooted in every student, One Earth Primary School also integrates three major values which acts as a foundation in life. Peace, harmony, and compassion are part of every subject taught in class. Each value is divided into 12 sub-categories.